This colorful wardrobe is built around a lot of staple pieces - like skinny jeans and black booties, but also a few pops of color. 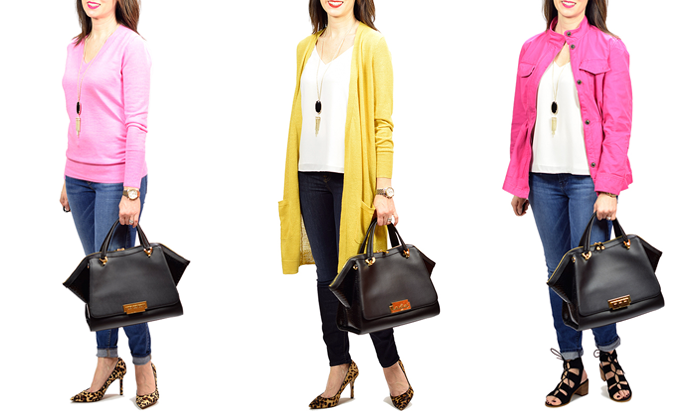 Also, these looks show how just switching out a pink sweater for a yellow cardigan can change up an entire look. A lot of these pieces are very budget friendly, like the tote that is only $15 (and also comes in beige). You can add the necklace for only $12. 1. These UGG slippers are 40% off. 2. This leopard scarf is marked down 30%. 3. These fun suede booties are on sale for 40% off. 4. This brocade velvet cami is 60% off - and would be perfect for NYE. 5. This cute skirt is under $20. 6. One of my favorite sweaters is on sale for under $20. 7. This dress with colorful tassels is 60% off. 8. This plaid blazer in an additional 60% off the sale price. 9. This sweater is on sale for $8. 10. This satin wrap dress - comes in the prettiest blue and also a bold red. 11. These are the cutest earrings that are an additional 25% off sale price (with free shipping). I LOVE that you're writing about spring (because I'm watching it snow and dreading shoveling, haha). 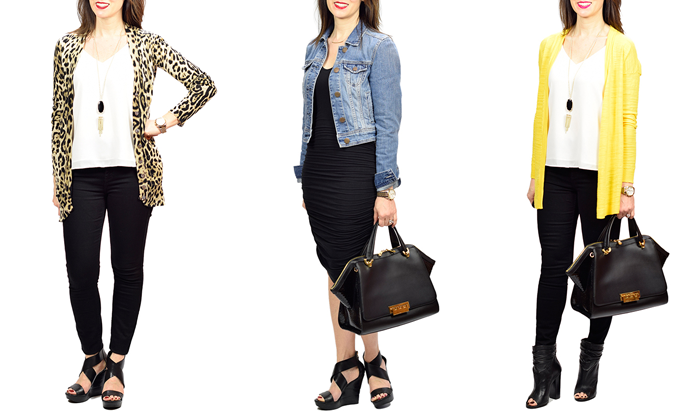 You're right, a few bright pieces go a long way - love the options you're showing!